Ted Brown Music - Pacific Drum Snare 18 Ply Bubinga/Maple/Bubinga 6.5"x14"
Drums & Percussion / Snare Drums / Pacific Drum Snare 18 Ply Bubinga/Maple/Bubinga 6.5"x14"
Pacific Drum Snare 18 Ply Bubinga/Maple/Bubinga 6.5"x14"
18-ply LTD Bubinga Snare - 2-ply Bubinga outer and inners with 14-ply Maple core and Chrome Hoops, a Natural Matte Satin Lacquer finish, and dual-turret tube-style Chrome lugs (6.5x14"). You can't build a good snare drum if you don't know what a good snare drum is supposed to be. Gimmicks are for the other guys. 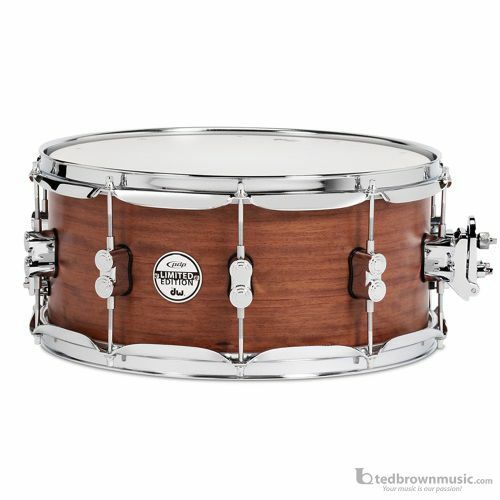 We just make great sounding snare drums that drummers can rely on. From the black nickel over brass Ace, to the all-maple SX Natural, these workhorse snares are getting a new generation of drummers talking and surprising some seasoned pros, too. You can't have too many snare drums, and PDP's here to fill out your collection.